On Monday, BBC News published an article whose headline asked: "Does the world need polymaths?" It examined why experts historically felt the need to excel in many disciplines, but now typically focus on only one. On Tuesday, as if the universe were playing some kind of cosmic joke, news broke that Bradley Walsh is set to be cast as the latest companion in the new series of Doctor Who. If there was ever a need for proof that the renaissance man is back, baby, then Bradley Walsh is that proof. The Watford-born entertainer, 57, started out as a professional footballer, signing to Brentford in 1978 and playing for Barnet and Dunstable Town before injuries put an end to all that. Walsh would later score a penalty for England in the Soccer Aid charity game at Old Trafford in 2010. Not satisfied with one sport, he is also adept at golf, with his team winning the second series of celebrity golf tournament All Star Cup on ITV in 2007. But sport's loss was television's gain. After a stint as a Pontins' bluecoat, Walsh hit the small screen, first as a presenter, a format that one might describe as his true calling, in which he continues to excel today as the host of ITV's The Chase. Thankfully, his Doctor Who commitments won't interfere, according to an anonymous friend who spoke to the Mirror to express relief. "He loves that show with a passion and so does the audience, so he's delighted to have found a way to make it all work." Walsh is also passionate about acting. He starred in Brit flick Mike Bassett: England Manager, and The Bill spin-off MIT: Murder Investigation Team. He spent two years in Coronation Street as Danny Baldwin, son of Mike and romancer of Leanne Battersby, before returning to the medium of TV programmes with a colon in the title, via Law and Order: UK, which was executive-produced by the new Doctor Who showrunner, Chris Chibnall. But if you thought sport, presenting, comedy and acting were enough to contain Walsh, you'd be mistaken: he was ready to take on music, too. In 2016, he had the biggest-selling debut album by a British artist and the only British debut to go gold in the UK. The title track, Chasing Dreams, begins with Walsh laying out some advice for people starting out in showbiz. He launches into song as big-band horns parp their joyful tune: "Just keep chasing your dreams and then never ever stop, and then smile with a heart full of love." If anyone knows, it's Bradley Walsh, jack of all trades, and master of them, too. APA 6th ed. : Nicholson, Rebecca (2017-08-23). 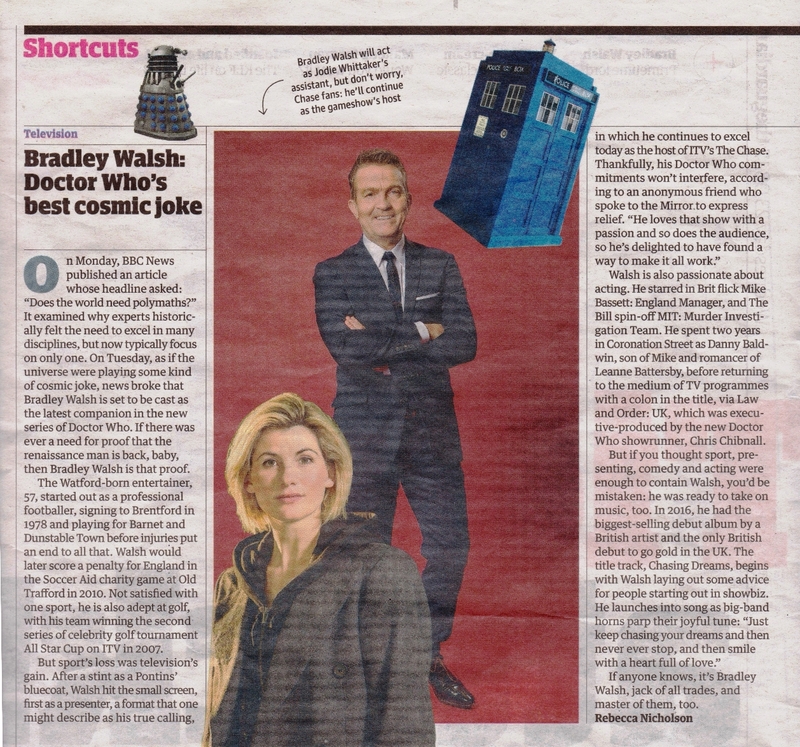 Bradley Walsh: Doctor Who's best cosmic joke. The Guardian . MLA 7th ed. : Nicholson, Rebecca. "Bradley Walsh: Doctor Who's best cosmic joke." The Guardian [add city] 2017-08-23. Print. Turabian: Nicholson, Rebecca. "Bradley Walsh: Doctor Who's best cosmic joke." The Guardian, 2017-08-23, section, edition. This page was last modified on 2 September 2018, at 01:59.